There’s a range of web-based tools you can use to put your customers in the driving seat and help them keep their vehicles on the road. A host of information is now readily available to you via a variety of official online motor industry sources. All of the following tools can be found by either searching the internet or bookmarking their web addresses on your computer. So please use them on behalf of your customers if you think they might help keep them, and their vehicles safe. Sign up to our DVSA direct email alerts service to receive a monthly email with details of the latest vehicle recalls. 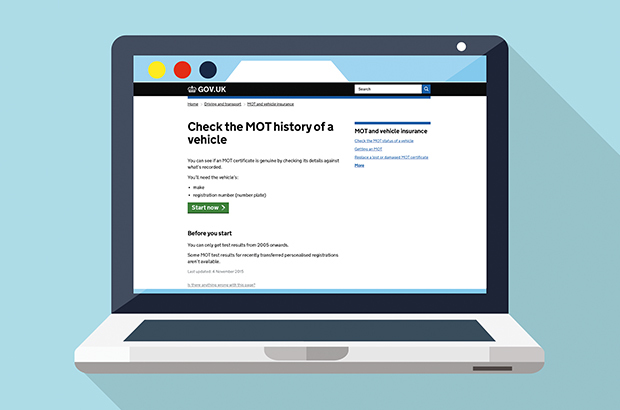 Check a vehicle’s MOT history by using the check the MOT history of a vehicle tool on the GOV.UK website. This service shows MOT test results from 2005 onwards and will confirm if the vehicle has an MOT by checking details against what’s been officially recorded. Check a vehicle’s tax, MOT and other details by using the check the MOT status of a vehicle tool on the GOV.UK website. As well as confirming when a vehicle’s next tax payment and MOT test are due, it will show various other details such as a vehicle’s year of manufacture and first registration date. There are a number of online reminder services available which customers can find by searching the internet and use to be notified when their next MOT test is due. However, to make sure this kind of service is available to everyone DVSA is currently working with GOV.UK to launch a new notification service. The new GOV.UK Notify service is due to be launched later in 2016. We’ll let you know more about how the service works nearer to its launch. In the mean time, details about the new service are available in the introducing GOV.UK Notify article.